Here at Kesta, we love to support our local talent. Entertainment, venues, food or music, when its home grown in the DMV Kesta will always let you know about it first. 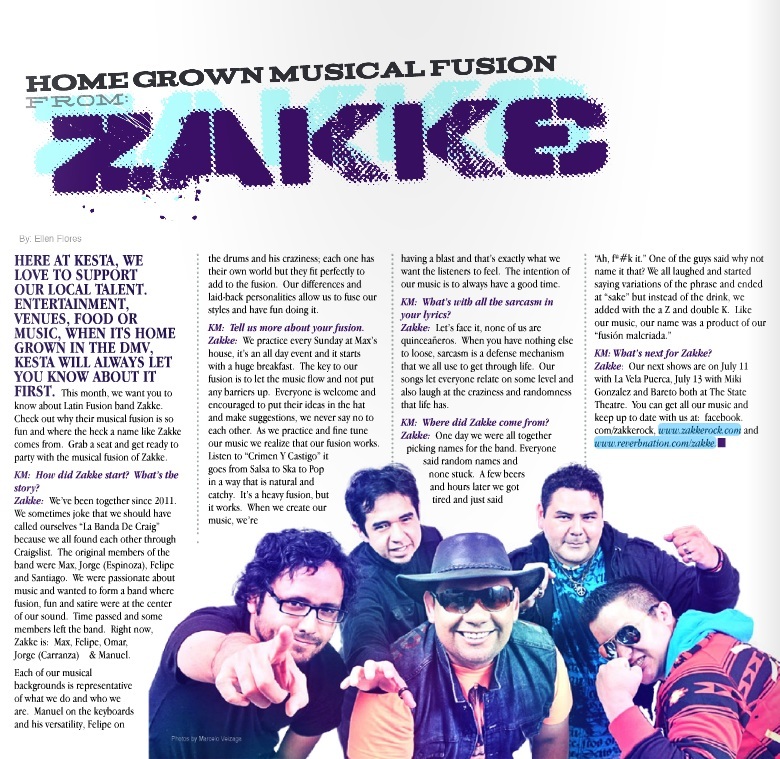 This month, we want you to know about Latin Fusion band Zakke. Check out why their musical fusion is so fun and where the heck does a name like Zakke come from. Grab a seat and get ready to party with the musical fusion of Zakke. Kesta: How did Zakke start? What’s the story? Zakke: We’ve been together since 2011. We sometimes joke that we should have called ourselves “La Banda De Craig” because we all found each other through Craigslist. The original members of the band were Max, Jorge (Espinoza), Felipe and Santiago. We were passionate about music and wanted to form a band where fusion, fun and satire were at the center of our sound. Time passed and some members left the band. Right now, Zakke is: Max, Felipe, Omar, Jorge (Carranza) & Manuel. Each of our musical backgrounds representative of what we do and who we are. Manuel on the keyboards and his versatility, Felipe on the drums and his craziness; each one has their own world but they fit perfectly to add to the fusion. Our differences and laid back personalities allow us to fuse our styles and have fun doing it. Kesta: Tell us more about your fusion. Zakke: We practice every Sunday at Max’s house, it’s an all day event and it starts with a huge breakfast. The key to our fusion is to let the music flow and not put any barriers up. Everyone is welcome and encouraged to put their ideas in the hat and make suggestions, we never say no to each other. As we practice and fine tune our music we realize that our fusion works. Listen to “Crimen Y Castigo” it goes from Salsa to Ska to Pop in a way that is natural and catchy. It’s a heavy fusion, but it works. When we create our music we’re having a blast and that’s exactly what we want the listeners to feel. The intention of our music is to always have a good time. Kesta: What’s with all the sarcasm in your lyrics? Zakke: Let’s face it, none of us are quinceañeros. When you have nothing else to loose, sarcasm is a defense mechanism that we all use to get through life. Our songs let everyone relate on some level and also laugh at the craziness and randomness that life has. Kesta: Where did Zakke come from? Kesta: What’s next for Zakke? Zakke: Our next shows are on July 11 with La Vela Puerca, July 13 with Miki Gonzalez and Barreto both at The State Theatre. You can get all our music and keep up to date with us at: facebook.com/zakkerock, www.zakkerock.com andwww.reverbnation.com/zakke.